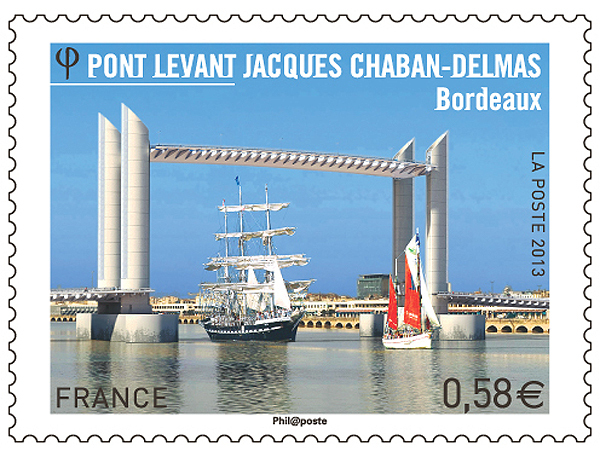 By the issues of 2013 the French Post gives: In March 2013 the Urban Community of Bordeaux, will inaugurated a new vertical lift bridge the Jacques Chaban-Delmas. The bridge will connect two Bordeaux districts across the River Garonne; the Bacalan district on the left bank and the La Bastide district on the right bank of the river. The bridge is designed by architect Thomas Lavigne and is a technical feat as it is one of the largest bridges in Europe, with a length of 433 metres and a height of 77 metres, her middle span can be lifted in just eleven minutes. From Wikipedia: The Pont Jacques Chaban-Delmas is a vertical-lift bridge over the Garonne in Bordeaux, France. It was inaugurated on 16 March 2013 by President François Hollande and Alain Juppé, mayor of Bordeaux. Its main span is 110 m (361 ft) long. As of 2013, it is the longest vertical-lift bridge in Europe. It is named in honour of Jacques Chaban-Delmas, a former Prime Minister of France and a former mayor of Bordeaux. 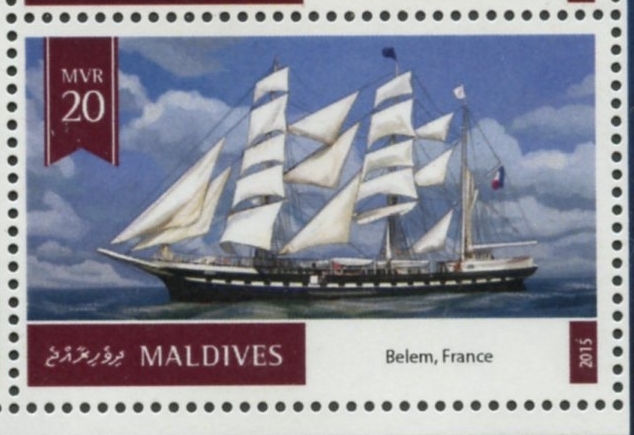 The larger ship shown on the French stamp issued in 2013 is the BELEM built as a three-mast barque under yard No 430 by S.A. des Ancien Chantiers Dubigeon Shipyard at Nantes-Chantenay for Denis Crovan & Comp., Nantes. 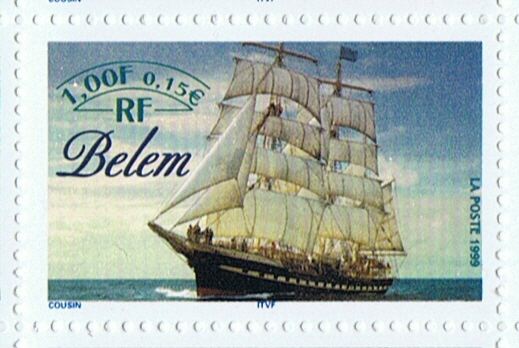 10 June 1896 launched as the BELEM (Bethlehem), named after the Brazilian port Belem. Tonnage 546 grt, dim.58 x 8.8 x 3.5m. (draught) Length bpp. 51.2m. 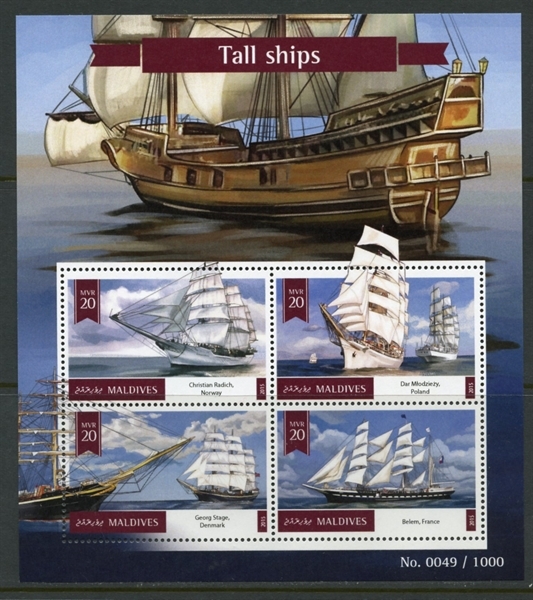 This type of ship was called in France an “antillais”. 30 July 1896 delivered to owners. 31July 1896 sailed on her maiden voyage from Saint-Nazaire under command of Captain Lemerle and a crew of 12 men in ballast to Montevideo before she headed to Brazil. Mostly in Brazil she loaded cocoa beans for the cocoa factory of Para at Paris. 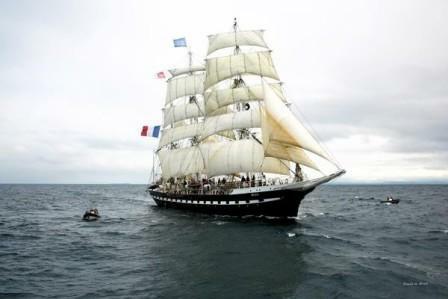 On her twelfth outward voyage in 1902 she sailed loaded with maize to Martinique in the French West Indies, due to lack of space at Saint-Pierre she was diverted to Havre du Robert on the other side of the island. Sunday 08 May 1902 Mount Pelée erupted, destroying Saint-Pierre and the ships in port and on the anchorage, killing at least 20,000 people including the crews of the destroyed ships. The BELEM on the other side of the island escaped without any damage. 1906 Sold to Demange Fréres, who used her in the service between France and Cayenne. Altogether she made 33 voyages across the Atlantic, but steamships took over the trade, and she was lucky that she not was scrapped. 11 February 1914 sold to the Duke of Westminster for £3,000 other source give £1,500 with the plan to convert her in a yacht. The conversion took place in the U.K. during World War I. Her deck superstructure enlarged. The iron bulwark on the poop was replaced by a wooden banister. Two Bollinder auxiliary engines built in each 250 hp. and fitted out with electric light. After the war she was used as a yacht by the Duke of Westminster only for four years. September 1921 sold to the Irish brewer Sir Ernest Guinness and renamed in FANTOME II. Under his ownership she made an around the world cruise and visited the Arctic waters and the Mediterranean. During World War II laid up at the Island of Wight. When Sir Ernest Guinness died in 1949 the yacht was already for a number of years moored in Seattle, Washington, and she was inherited by his wife. 1951 She was sold to Centro Marinaro des Istituto “Scilla” of the Fondazione Giorgio Cini, and she was renamed GIORGIO CINI. Re-rigged as a barkentine and used as a school-ship with home port Venice, Isola di S. Georgio Maggiore. Accommodation for 60 boys between the ages of 12 – 15 years. Between 1965 till 1965 she made training voyages in the Mediterranean. Thereafter used as stationary school ship at San-Giorgio Maggiore, she was considered to old for sailing training voyages. 1972 Was she donated to the Italian Carabinieris who would restore her, and she was moved to Cantieri Navali e pharmacy Meccaniche di Venezia (CNOMV). Her old Bollinder engines were replaced by two 300 hp each Fiat diesel engines. Her rigging was restored into a barque rig, and her wooden masts were replaced by steel masts. 1976 The carabinieris were running out of cash and could not more pay the invoices of the shipyard and the ship became the property of the yard. 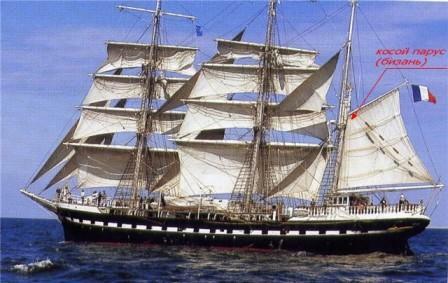 27 January 1979 she was sold by the yard for 4.5 million francs to the French bank Union Nationale des Caisses d’Epargnes de France. 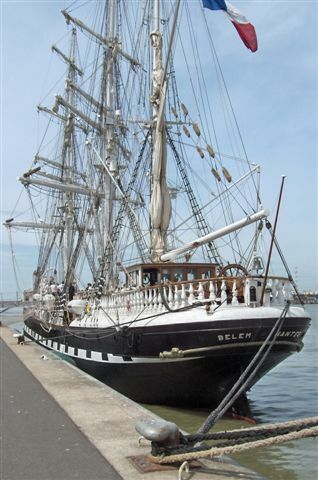 Renamed again in BELEM with homeport Nantes. 17 September 1979 arrived at Brest where some restoration work was carried out. 08 September 1981the BELEM was then towed upstream the River Seine and moored at the feet of the Eiffel Tower at Quai de Suffren to service as a floating attraction. She stayed in Paris for four years in which she was visited by almost a half-million of people. Then was she given in the hands of a shipyard in Saint-Nazaire and mostly by the work of volunteers and the cost of 18,000,000 Fr she was restored to her former glory. Her first voyage after completing restoration was across the Atlantic after her last crossing 72 years ago for the Celebration of Centenary of the Liberty statue in New York in July 1986. 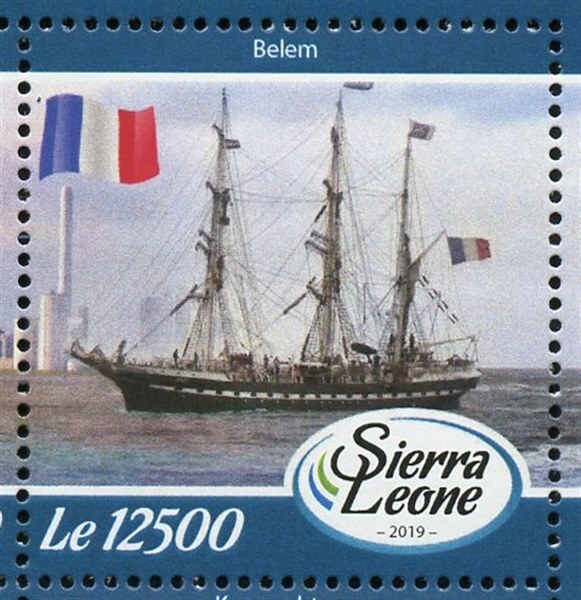 From 1987 was she used as a training ship, managed by Foundation to the Société Morbihanaise and Nantaise de Navigation, and owned by Fondation BELEM, Paris. Crew five officers, 11 sailors and 48 cadets. 2013 Still in service and you can see her in many Tall Ships Races. France 1999 1Fr sg?, scott2736f and 2013 0.58 Euro sg?, scott? From my Russian contact I got a few images more on the BELEM. 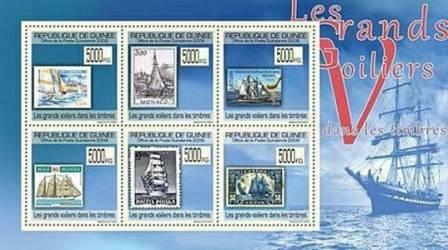 Guinea 2009 5000fg sg?, scott?, in margin of stamp. Guinea 2009 29000 fg sg?, scott? in margin of stamp on the right. And two photo’s of the ship. Sierra Leone 2019 LE12500 sg?. scott?